The Scanning Helium Microscope is currently in operation at Newcastle, taking advantage of prior work in conjunction with the University of Cambridge. The first samples to be imaged were those exhibiting the most dominant contrast mechanism available to SHeM, namely topological contrast. The changing mean plane of the surface will result in differences in the amount of helium backscattered towards the detector, thus allowing an image of the sample to be generated. As a demonstration of a typical image from the new instrument, the figure below shows sections of a wing from the butterfly species Tirumala hamata as imaged via SHeM (along with an optical micrograph for comparison). It should be noted that due to the nature of the neutral helium probe, no sample preparation was required (such as the gold coating necessary for such samples in scanning electron microscopy to prevent charging and/or damage). The ripples through the wing membrane quite obvious, as is shadowing of the helium beam by raised features such as the raised scales along the ridges, marking the presence of the veins through the wing. 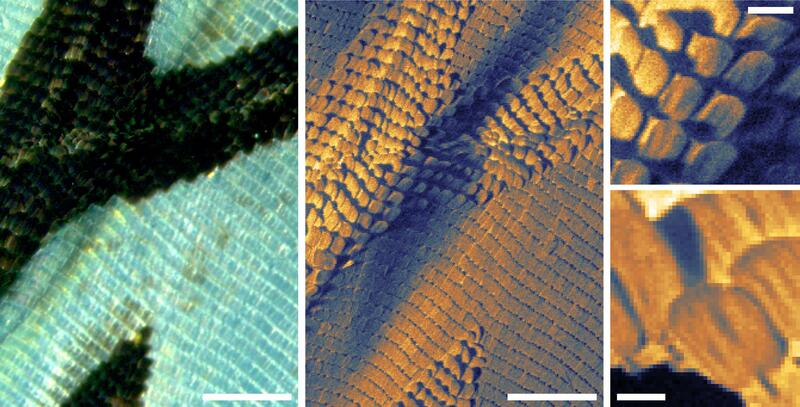 Butterfly wing (Tirumala hamata) as imaged with both optical and scanning helium microscopy. Scale bars are 600 um (left and center images), 100 um (top right) and 50 um (bottom right) respectively. SHeM imaging reveals the complex nature of the folds of the wing and the orientation of its scales, with no possibility for damage. Even more exciting is the first evidence of the chemical contrast available to the technique, originating in inelastic interactions between the neutral helium probe and a sample surface. Through the ANFF network, 40 nanometres of various metals were laid down on a silicon substrate in the shape of the University of Newcastle logo. As shown in the figure below, when imaged under SHeM there is distinct contrast between each of the metal layers and the silicon substrate, indicating a change in the nature of the scattering based on the atomic species. Work is currently underway at the Centre to further understand and model this more exotic contrast mechanism, opening the door to compositional analysis using SHeM. Metal semiconductor interfaces as imaged using neutral helium. SHeM micrographs show the University of Newcastle logo in 40 nanometre thick layers of different metals on a silicon substrate. Clockwise from top left: Gold, Nickel, Platinum and Chromium. Scale bar: 50 µm.